All I heard from everywhere, it is the voice of Allah alone. 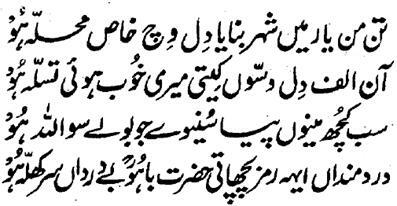 Hazrat Bayazid Bastami Rahmatu-Allahe Ta-aala Alaihe says that'I have been talking with Allah Almighty for thirty years and people had been thinking if I was talking with them'. 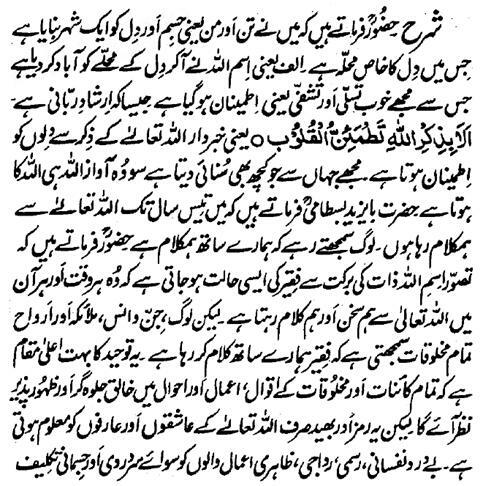 Hazrat Sultan Bahu Rahmatu-Allahe Ta-aala Alaihe says that such a condition becomes of the Faqeer through the Auspiciousness (and blessing) of the Name-Allah-the-Essence (Ism-e-Allah-Zaat) that he, all the time and every moments, talks with Allah Almighty but the people, Jinn, Spirits, Angels and the entire creation think that the Faqeer is talking with them. This is very high Station of Tauheed that the Creator will be seen and manifested in the whole universe and the sayings, conditions and deeds of the creation. However, this enigma and Secret is known only by the ached Aashiqeen and Arifeen of Allah Almighty. Stone hearted carnal beings and those with formal and customary deeds and actions have gained nothing besides the headache and exertion. What (efficacious) effectiveness would this kind of Zikr and Fikr yield?